IT HAD all come down to this moment. The training, the preparation, the many layers of inadequate and optimistic planning crystallised into the pre-dawn minutes of April 25, as the first boats bearing Australian soldiers came ashore near Ari Burnu point about 4.30am. That spot was about 1km north of where the British and Anzac generals had envisaged they would land, meaning when the first wave of men from the 3rd Brigade hit the shore, they were confronted with vertiginous terrain they weren't expecting. It would be the first of many things to go wrong that day. That first wave was to clear Gaba Tepe, capture any Turkish guns and allow the rest to start moving up towards Hill 971 and other higher ground. But there was chaos from the start - reserve troops unsure of their location got mixed up with the main landing forces, and battalions that were supposed to be on one flank of the movement ended up on the other. By 9am, most of the Australian infantrymen - the 1st and 2nd brigades, plus their mountain guns - were onshore. The Turks had not been prepared for a landing this strong near Gaba Tepe, so despite the confusion of those first few hours, the Australians were able to advance relatively quickly in the face of little Turkish opposition beyond some rifle fire from coastal sentries and small numbers of troops whose aim was to hold a position until reinforcements came. But if the advance was enthusiastic, it was also disorganised. This was in part due to the failure of the maps the British had been using - the terrain just didn't reflect what they said. As a result, troop movements had to be adjusted on the spot and this led to further disarray. And there was one critical decision that changed the Anzac strategy from an attacking to a defensive one - uncertain of both the terrain and the Turkish opposition that lay ahead, 3rd Brigade commander Colonel Ewen Sinclair-MacLagan ordered his troops to dig in on a ridge short of the objective, rather than advance further. Meanwhile, the Turkish were organising their defences and Sinclair-MacLagan's halt gave them time. The Turkish 27th Regiment arrived to oppose the front line of Anzacs by about 8.30am, while 19th Division commander Mustafa Kemal also ordered his 57th Regiment to Hill 971, telling them to advance to Baby 700 and hold it at all costs. Every member of the 57th Regiment was either wounded or killed. As Australian and New Zealand reinforcements kept pouring forth and the Turks organised their defences as the day went on - with the added advantage of having the higher ground - the soil of the Gallipoli Peninsula became soaked with blood. By the end of that first day, the Anzac casualty list would number about 2000, and after five days of battle there would be 860 dead. Late in the evening, Anzac commander General William Birdwood sent Mediterranean Expeditionary Force commander General Sir Ian Hamilton a note to ask if they could discuss evacuation proposals. Hamilton rejected this, telling Birdwood the troops had "got through the difficult business" and instead ordered the Anzacs to dig in. GERMAN general Otto Liman von Sanders, who was commanding the Turkish 5th Army on the Gallipoli Peninsula, had not been expecting a large landing at Gaba Tepe. Von Sanders, whose army consisted of six divisions, was most concerned about Besika Bay, on the Asian side of the straits, because there was an easy passage to their batteries; Cape Helles, at the tip of the peninsula; Bulair further inland, where the peninsula was only a few miles wide; and Gaba Tepe, because it led to the heights of Hill 971. Turkish lieutenant colonel Mustafa Kemal, commanding the 19th Division, believed Gaba Tepe to be most susceptible precisely because of its passage to the heights - and he believed the heights were key. Von Sanders' approach was to concentrate his six divisions of about 60,000 men inland, but within reach of what he believed the main threats to be. This meant there were light security detachments along the coastline to keep watch for the anticipated landings, but the bulk of his men were in two divisions near Bulair in the north, two in the south to respond either to Gaba Tepe or Cape Helles, and two on the Asian side to protect Kum Kale and Besika Bay. In the end, they were both right. The British came ashore at five beaches of Cape Helles in the main landings, while the Anzacs landed just north of Gaba Tepe, and the French carried out a diversionary landing at Kum Kale. While Von Sanders' plan aimed to have his troops mobile and flexible to where the landings happened, it also meant there was little resistance to the Anzac landing until about four hours after they came ashore. It also meant - contrary to the overblown reports from British journalist Ellis Ashmead-Bartlett, who was not ashore but on a ship during the landings - there was very likely no machine-gun fire on the Anzacs until the Turkish 27th Regiment arrived at the ridges over Gaba Tepe about 8.30am. April 27: A Turkish counter-attack is mounted under the command of Mustafa Kemal, but fails to drive the Anzacs into the sea. May 9: A party from the 15th Battalion creep out at night and capture the Turkish trench in front of Quinn's Post, before being driven out the next morning, suffering heavy casualties. May 15: AIF commander General Bridges is mortally wounded by a Turkish sniper, dying at sea three days later. He is replaced by General Harold Walker. May 19: Huge Turkish offensive to push Anzacs back into the sea, using 42,000 troops, but defenders suffer massive casualties - estimated at 7000 wounded and 3000 dead. By comparison, Anzac casualties are about 470 wounded and 160 killed. May 24: Due to enormous Turkish losses of May 19, Anzacs agree to a Turkish request for an eight-hour truce to collect and bury the dead. Many soldiers exchange gifts and cigarettes. May 29: The Turks attack and break into Quinn's Post after exploding a mine close to the Australian front line. After heavy fighting the Turks are driven out and the position restored. During the fighting Major Hugh Quinn, after whom the post was named, is killed. 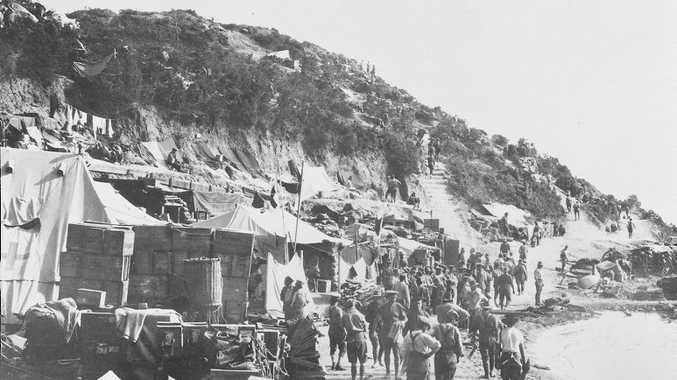 July 3: A medical report from the 1st Australian Casualty Clearing Station at Anzac Cove notes dysentery is becoming acute. August 6: Beginning of the August Offensive, including key Australian battles at Lone Pine, The Nek, Quinn's Post and Pope's Hill. October 8: The first severe autumn storm lashes the Gallipoli Peninsula from the south-west. Considerable damage is done at Anzac Cove, particularly to the water supply. October 15: General Sir Ian Hamilton is sacked as commander of the Mediterranean Expeditionary Force, and is replaced by General Charles Monro almost two weeks later. November 15: Minister of War Lord Kitchener visits the Gallipoli Peninsula and recommends evacuation. November 22: Preliminary plan drawn up for the evacuation of all three Allied-held areas of Gallipoli - Anzac, Suvla and Helles. December 18: Over two nights the remaining 20,000 Anzacs are withdrawn from Gallipoli. ONE of the few successes of April 25 was the Australian submarine AE2's penetration of the Dardanelles into the Sea of Marmara. The AE2, under Lieutenant Commander Henry Stoker, had been tasked to "run amok" with Turkish shipping in the Sea of Marmara, with the eventual aim of cutting off communications and the shipping of Ottoman troops to the Gallipoli Peninsula. The submarine entered the Dardanelles about two hours before the infantry landed ashore, and spent several days evading its pursuers and trying to torpedo Turkish boats - although few of these hit their target. But the AE2's luck ran out on April 30, when it was hit by the guns of the Turkish torpedo boat Sultan Hissar. Stroker had no choice but to abandon his vessel. 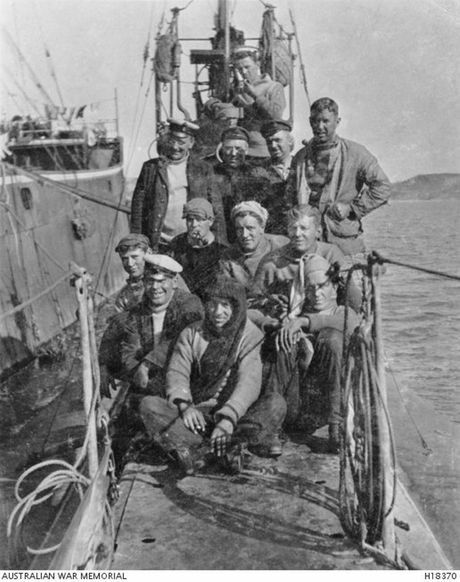 The 32 crew members were taken prisoner for the rest of the war, and four later died of disease as a result of malnutrition and hard labour in a harsh climate.